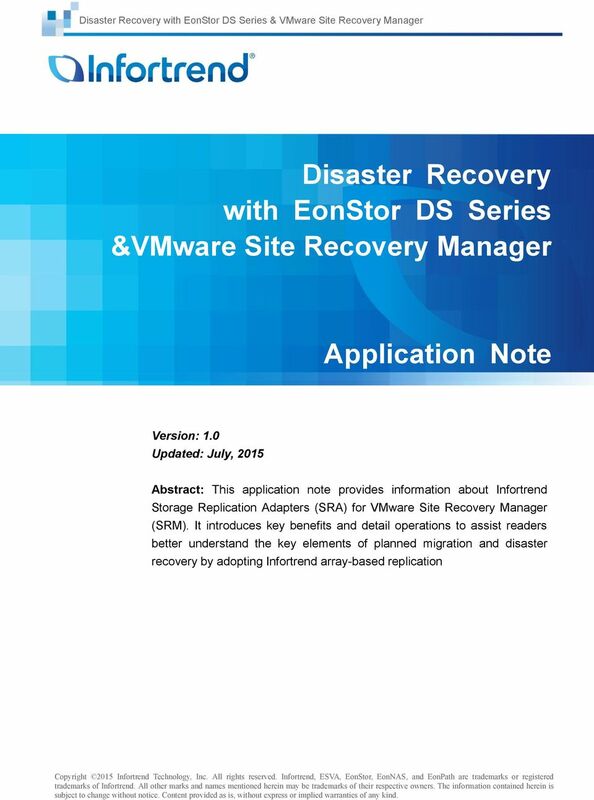 Download "Disaster Recovery with EonStor DS Series &VMware Site Recovery Manager"
1 Disaster Recovery with EonStor DS Series &VMware Site Recovery Manager Application Note Version: 1.0 Updated: July, 2015 Abstract: This application note provides information about Infortrend Storage Replication Adapters (SRA) for VMware Site Recovery Manager (SRM). It introduces key benefits and detail operations to assist readers better understand the key elements of planned migration and disaster recovery by adopting Infortrend array-based replication Copyright 2015 Infortrend Technology, Inc. All rights reserved. Infortrend, ESVA, EonStor, EonNAS, and EonPath are trademarks or registered trademarks of Infortrend. All other marks and names mentioned herein may be trademarks of their respective owners. The information contained herein is subject to change without notice. Content provided as is, without express or implied warranties of any kind. 3 Introduction With rapid development of enterprise businesses, the reliability and availability of the IT based systems have become more important than ever. Data lost and services going offline caused by natural disaster or human error is always a nightmare for IT administrators. Therefore, disaster recovery (DR) plan has become indispensable in order to ensure uninterrupted seamless flow of business operation. However, like any excellent recovery plan in the virtual environment, it may require manual steps that are lengthy, costly and complicated for IT staffs. 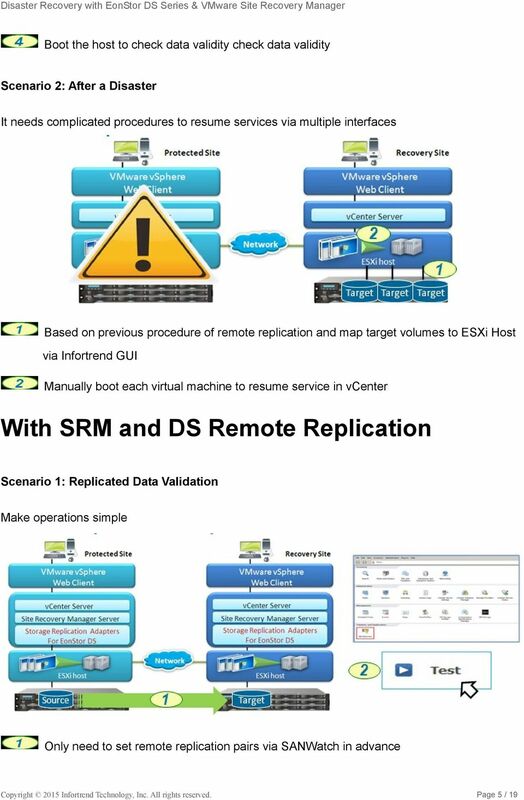 In order to meet Recovery Time Objective (RTO) and Recovery Point Objective (RPO) requirement of various businesses, Infortrend EonStor DS series delivers proven storage replication adapters (SRA) that is thoroughly integrated with VMware Site Recovery Manager (SRM) and Infortrend Remote Replication. This translates to simplified and automated key elements of disaster recovery. It includes setting up disaster recovery plans, testing, executing planned or unplanned failover, reversing replication and failback. 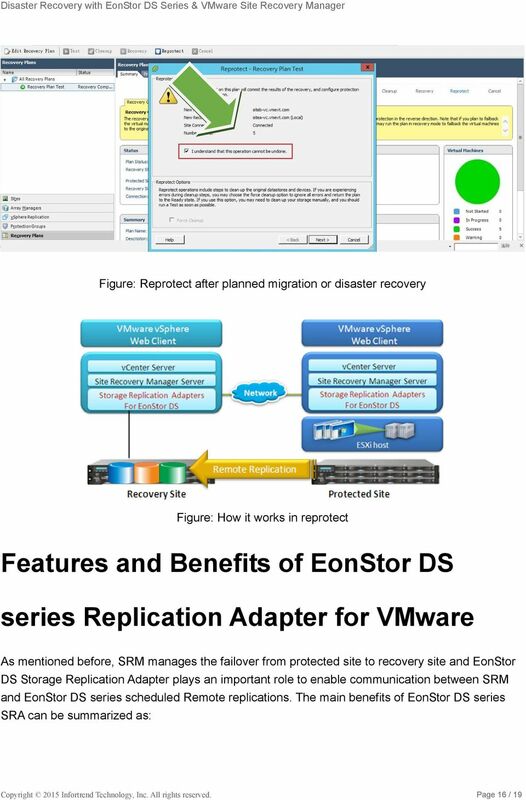 By integrating with VMware SRM to execute disaster recovery plan, EonStor DS is the ideal solution to meet these business needs, and more. 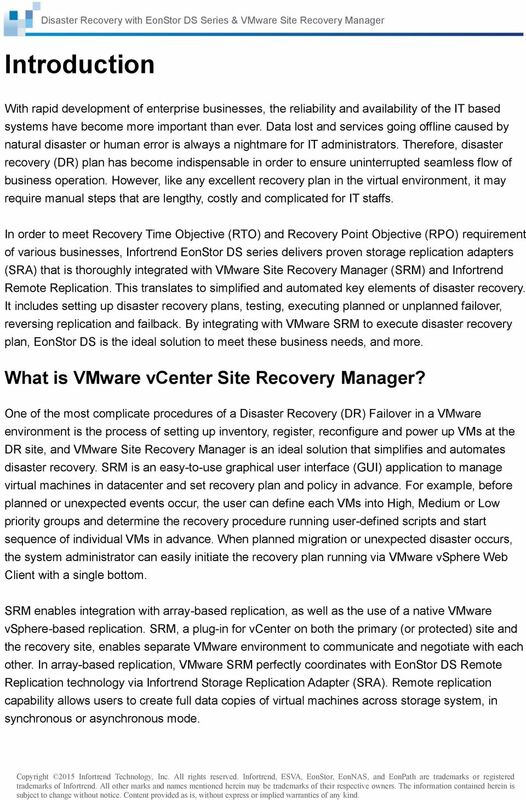 What is VMware vcenter Site Recovery Manager? 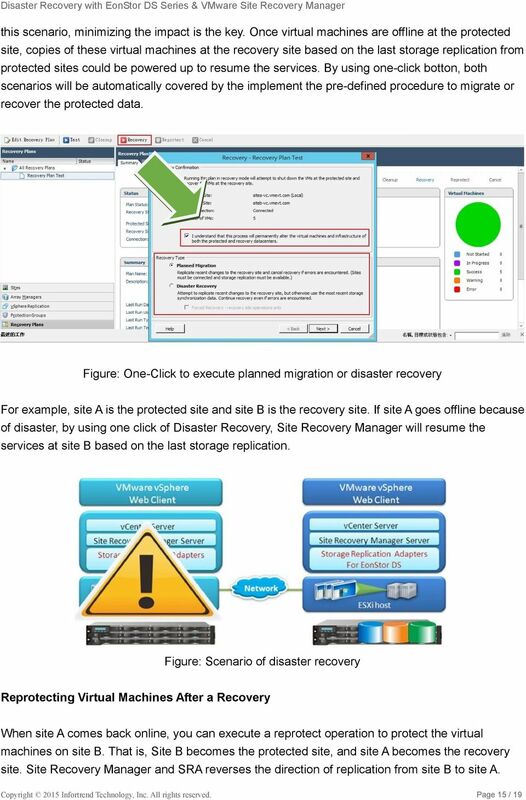 One of the most complicate procedures of a Disaster Recovery (DR) Failover in a VMware environment is the process of setting up inventory, register, reconfigure and power up VMs at the DR site, and VMware Site Recovery Manager is an ideal solution that simplifies and automates disaster recovery. 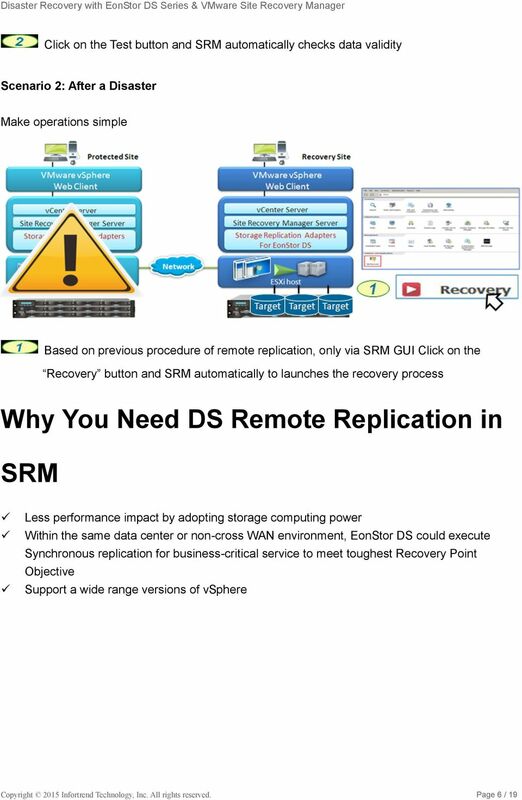 SRM is an easy-to-use graphical user interface (GUI) application to manage virtual machines in datacenter and set recovery plan and policy in advance. For example, before planned or unexpected events occur, the user can define each VMs into High, Medium or Low priority groups and determine the recovery procedure running user-defined scripts and start sequence of individual VMs in advance. 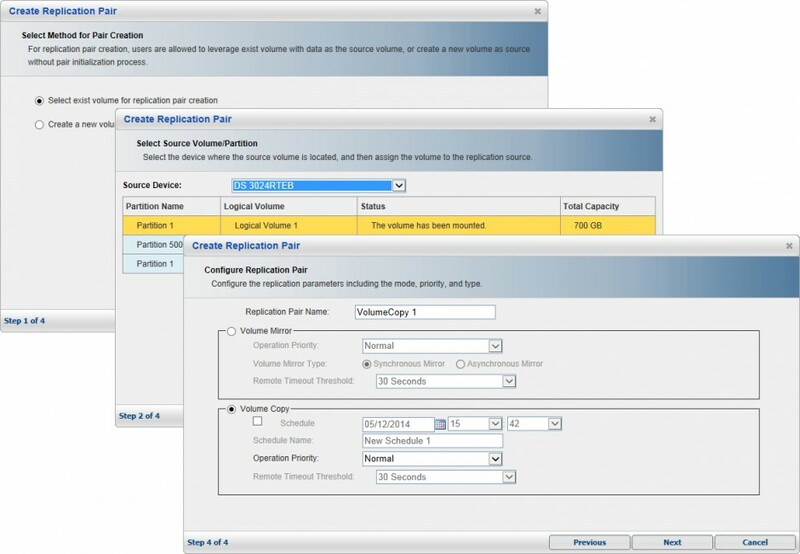 When planned migration or unexpected disaster occurs, the system administrator can easily initiate the recovery plan running via VMware vsphere Web Client with a single bottom. 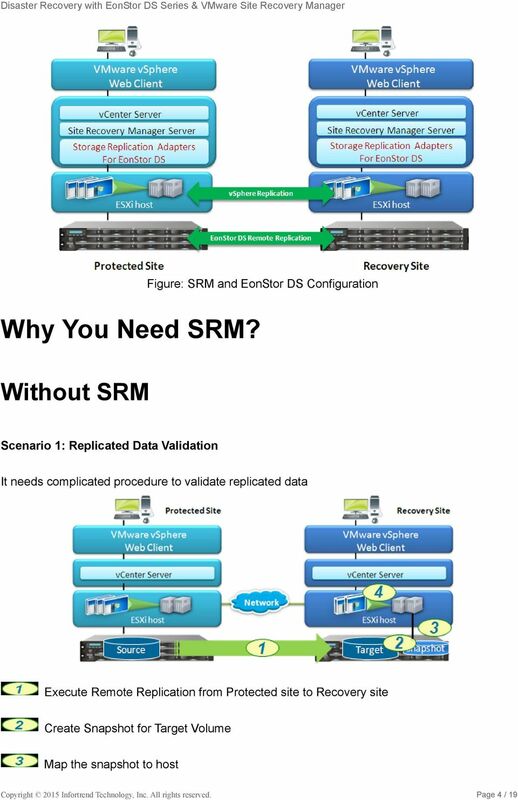 SRM enables integration with array-based replication, as well as the use of a native VMware vsphere-based replication. 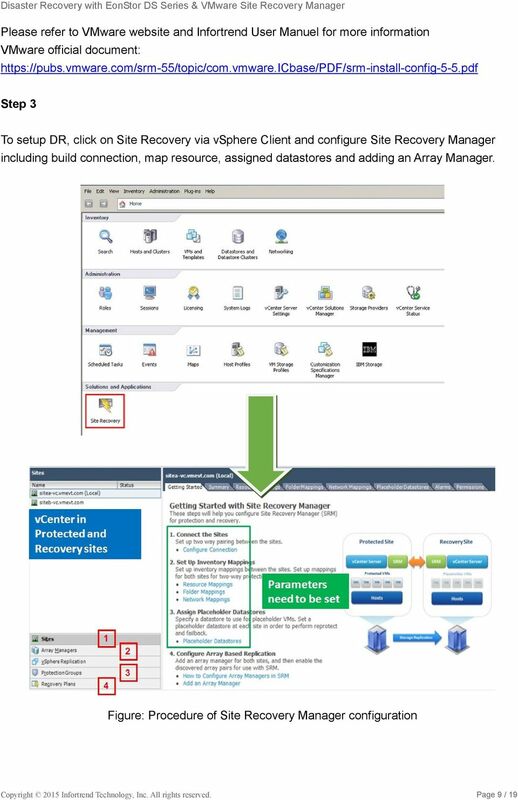 SRM, a plug-in for vcenter on both the primary (or protected) site and the recovery site, enables separate VMware environment to communicate and negotiate with each other. 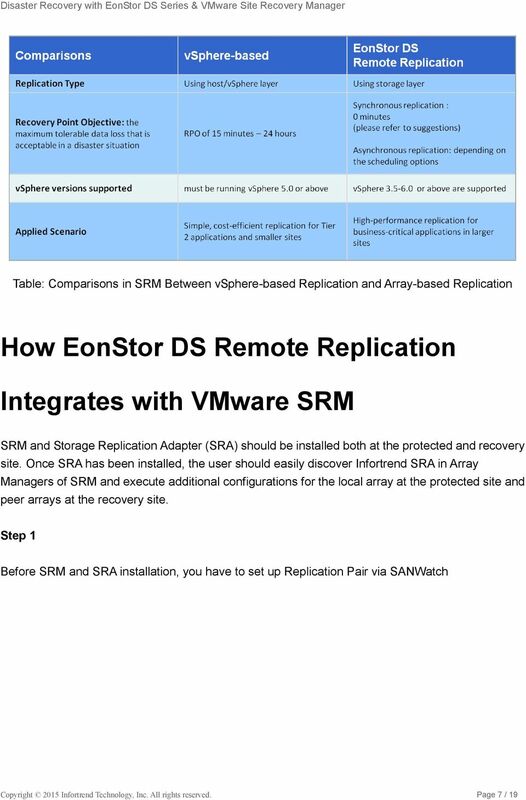 In array-based replication, VMware SRM perfectly coordinates with EonStor DS Remote Replication technology via Infortrend Storage Replication Adapter (SRA). 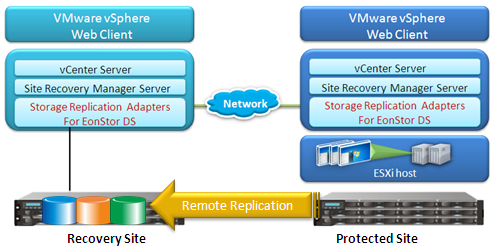 Remote replication capability allows users to create full data copies of virtual machines across storage system, in synchronous or asynchronous mode. Copyright 2015 Infortrend Technology, Inc. All rights reserved. Infortrend, ESVA, EonStor, EonNAS, and EonPath are trademarks or registered trademarks of Infortrend. All other marks and names mentioned herein may be trademarks of their respective owners. The information contained herein is subject to change without notice. Content provided as is, without express or implied warranties of any kind. 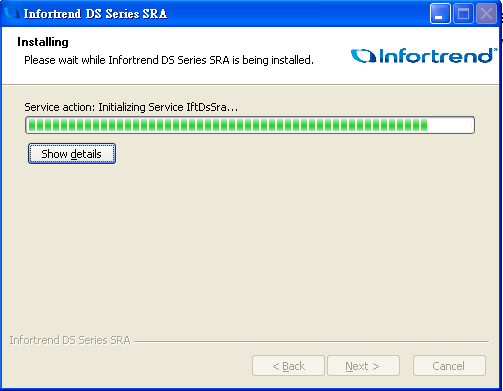 10 Step 4 After establishing a basic connection between primary and remote sites, the user should discover Infortrend SRA in Array Managers. Users may configure Local and Peer array IP addresses. 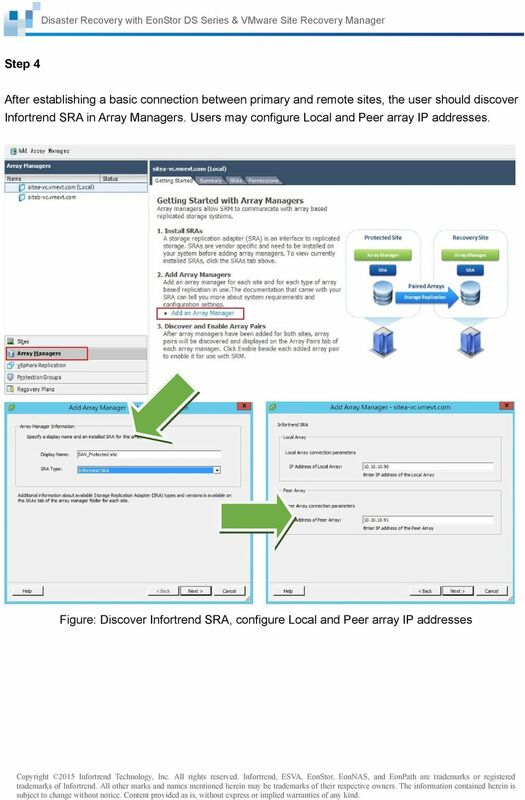 Figure: Discover Infortrend SRA, configure Local and Peer array IP addresses Copyright 2015 Infortrend Technology, Inc. All rights reserved. Infortrend, ESVA, EonStor, EonNAS, and EonPath are trademarks or registered trademarks of Infortrend. All other marks and names mentioned herein may be trademarks of their respective owners. The information contained herein is subject to change without notice. Content provided as is, without express or implied warranties of any kind. 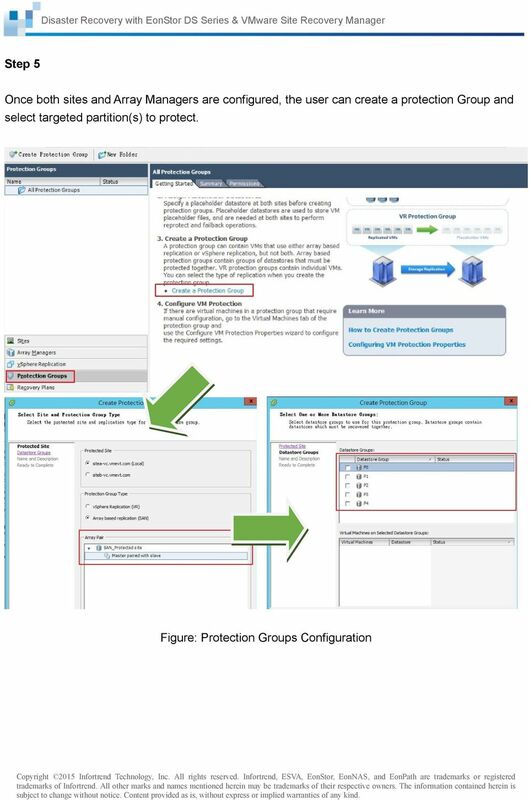 11 Step 5 Once both sites and Array Managers are configured, the user can create a protection Group and select targeted partition(s) to protect. Figure: Protection Groups Configuration Copyright 2015 Infortrend Technology, Inc. All rights reserved. Infortrend, ESVA, EonStor, EonNAS, and EonPath are trademarks or registered trademarks of Infortrend. All other marks and names mentioned herein may be trademarks of their respective owners. The information contained herein is subject to change without notice. Content provided as is, without express or implied warranties of any kind. 12 Step 6 Finally, the user can set up a recovery plan based on requirement. 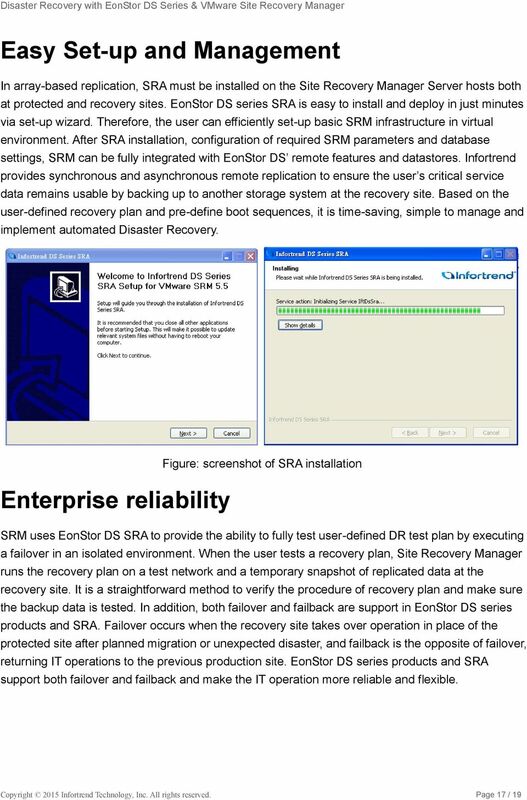 The SRA allows for lots of interaction workflows between SRM server and EonStor DS series storage, including Test, Cleanup, Recovery, and Reprotect. Figure: Start to build recovery plans In addition, the user can define the priority for each virtual machine. 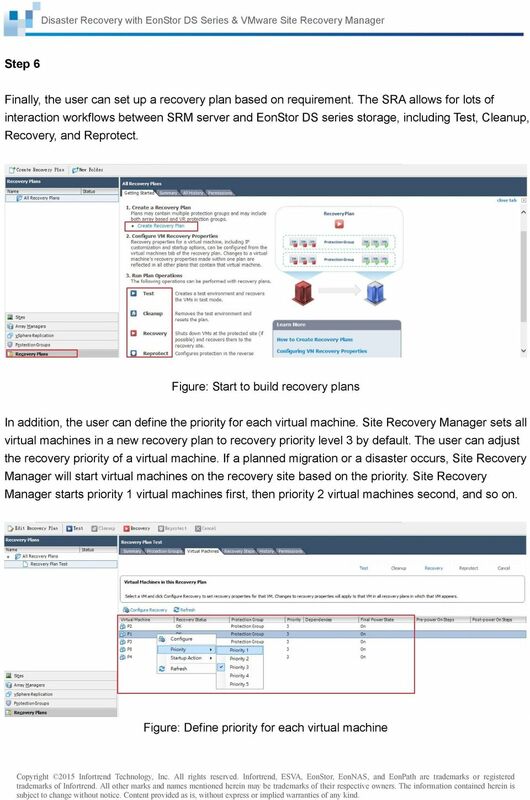 Site Recovery Manager sets all virtual machines in a new recovery plan to recovery priority level 3 by default. The user can adjust the recovery priority of a virtual machine. If a planned migration or a disaster occurs, Site Recovery Manager will start virtual machines on the recovery site based on the priority. 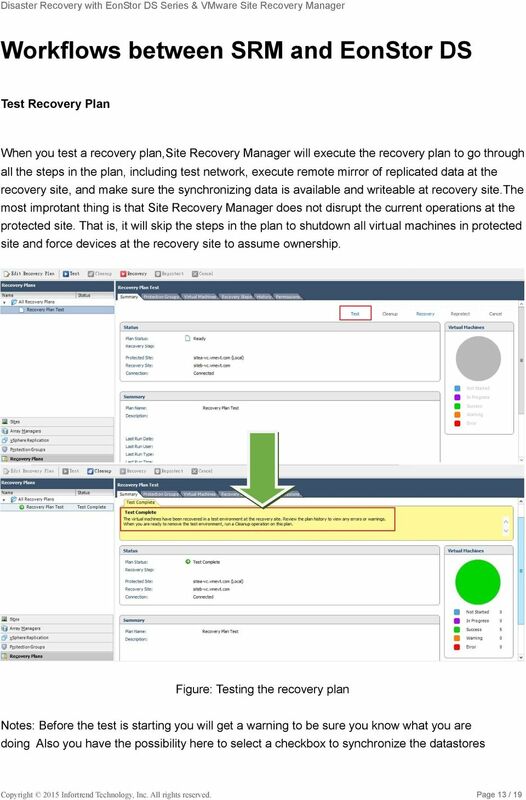 Site Recovery Manager starts priority 1 virtual machines first, then priority 2 virtual machines second, and so on. Figure: Define priority for each virtual machine Copyright 2015 Infortrend Technology, Inc. All rights reserved. Infortrend, ESVA, EonStor, EonNAS, and EonPath are trademarks or registered trademarks of Infortrend. All other marks and names mentioned herein may be trademarks of their respective owners. The information contained herein is subject to change without notice. Content provided as is, without express or implied warranties of any kind. 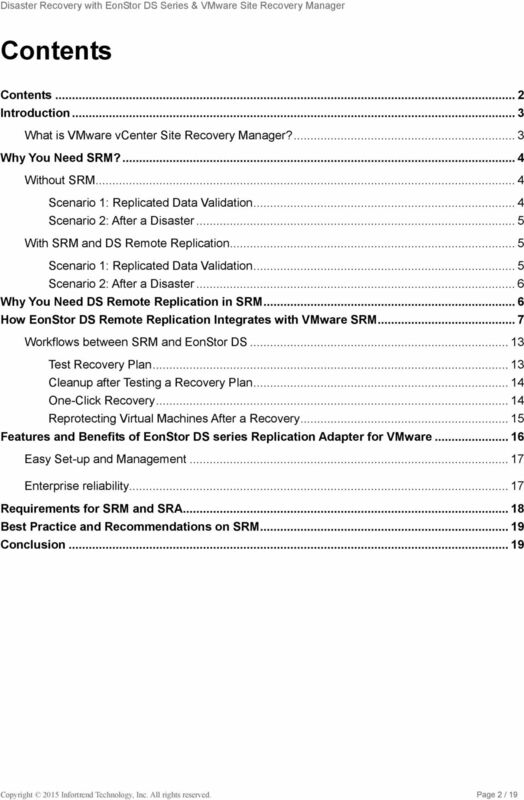 18 Requirements for SRM and SRA Requirements for EonStor DS series: Remote Replication License both in protected site and recovery site Recommended systems with firmware 5.13D01 or later VMware vcenter SRM requirements VMware vcenter Site Recovery Manager 5.5 or 5.8 license SRA (on the server installed with vcenter Server and SRM) VMware tools for Guest OS virtual machine vcenter and SRM support Windows Platform only Windows Server 2003 is not a supported platform for SRM Server but the SRM installer allows you to install SRM on Windows Server 2003 VMware vcenter SRM and Compatibility Matrixes including vsphere Editions, ESX/ESXi Server requirement, Support Database software, Host Operating System compatibility, etc. 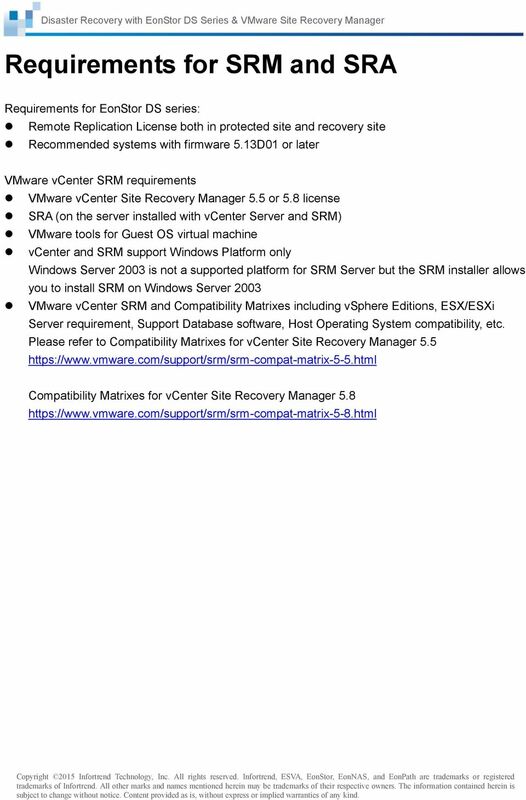 Please refer to Compatibility Matrixes for vcenter Site Recovery Manager Compatibility Matrixes for vcenter Site Recovery Manager Copyright 2015 Infortrend Technology, Inc. All rights reserved. Infortrend, ESVA, EonStor, EonNAS, and EonPath are trademarks or registered trademarks of Infortrend. All other marks and names mentioned herein may be trademarks of their respective owners. The information contained herein is subject to change without notice. Content provided as is, without express or implied warranties of any kind. 19 Best Practice and Recommendations on SRM 1. Prepare an organized recovery plan in advance i. Define the backup schedule to meet RTO and RPO requirements ii. Test the recovery plan to make sure its usable iii. Define the importance of each virtual machine and assign each VMs into High, Medium or Low priority groups and determine the start sequence of individual VMs in advance. 2. SRA only supports replication between identical hardware models 3. Within the same data center or non-cross WAN environment, EonStor DS could execute Synchronous replication for business-critical service 4. The user may choose asynchronous mode to allow the mirroring to occur during off-peak hours in order to have effective bandwidth utilization and also helps to reduce costs 5. 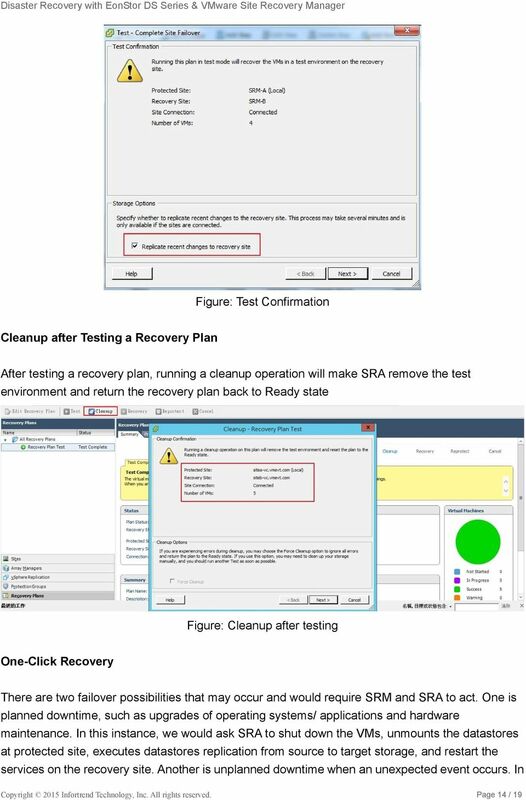 To ensure successful remote replication in array-based scenario, users are advised to reserve extra space in the storage system at recovery sites 6. 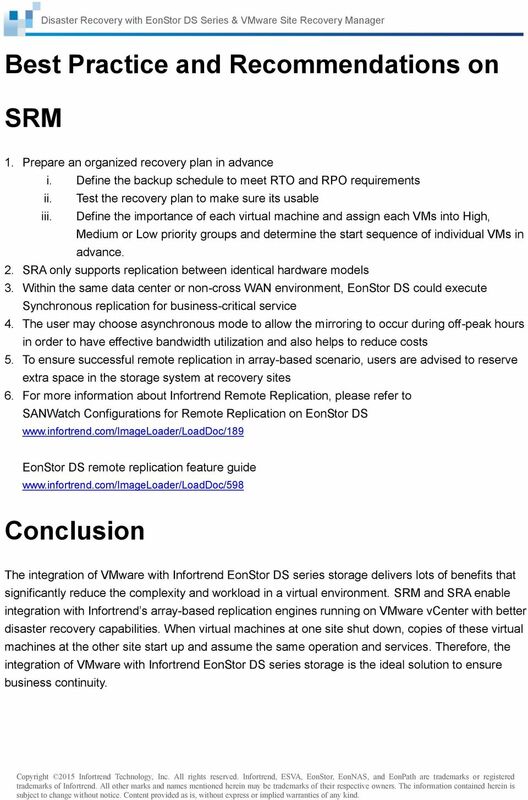 For more information about Infortrend Remote Replication, please refer to SANWatch Configurations for Remote Replication on EonStor DS EonStor DS remote replication feature guide Conclusion The integration of VMware with Infortrend EonStor DS series storage delivers lots of benefits that significantly reduce the complexity and workload in a virtual environment. 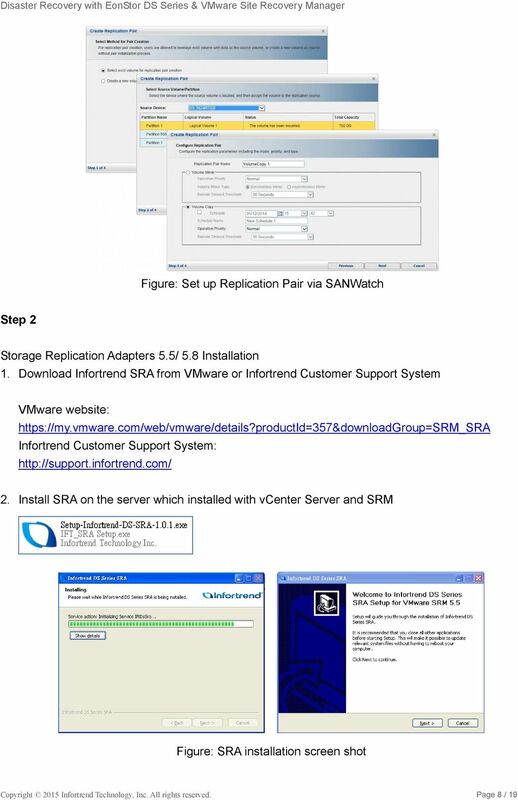 SRM and SRA enable integration with Infortrend s array-based replication engines running on VMware vcenter with better disaster recovery capabilities. When virtual machines at one site shut down, copies of these virtual machines at the other site start up and assume the same operation and services. Therefore, the integration of VMware with Infortrend EonStor DS series storage is the ideal solution to ensure business continuity. Copyright 2015 Infortrend Technology, Inc. All rights reserved. Infortrend, ESVA, EonStor, EonNAS, and EonPath are trademarks or registered trademarks of Infortrend. All other marks and names mentioned herein may be trademarks of their respective owners. The information contained herein is subject to change without notice. Content provided as is, without express or implied warranties of any kind. Using EonOne to Centralize the Management of all EonNAS devices Application Note Abstract This application note describes how to manage multiple EonNAS devices across your network with the help of EonOne.